You are currently browsing the tag archive for the ‘Art Davis’ tag. Penned by Sid Marcus and animated by Art Davis, ‘Technoracket’ is one of those cartoons inspired by rumors of robots taking over, like Fleischer’s ‘The Robot‘ from 1932, and ‘Mickey’s Mechanical Man‘ from one month later. Unlike those boxing-themed cartoons ‘Technoracket’ is surprisingly prophetical. In this cartoon Scrappy has a farm, in which Oopy does all the work, with help of the farm animals. But when Scrappy reads about the new age of technocracy he fires all animals, switching to robots, instead. Because it’s a cartoon, even the cows and chickens become robots, with the cows producing bottles of milk instantly. There’s also a scene in which a robots plants bolts to grow plants of canned tomatoes. At one stage, however, Oopy sneaks into Scrappy’s house and destroys his controls, making the robots go wild. This leads to some nightmarish scenes. There’s for example a robot which devours a pig to spit out hams, another robot brutalizes a mechanical chicken forcing it to produce numerous eggs. Soon the robots create havoc in Scrappy’s home, and he himself removes the controls, which explode in the backyard, destroying all robots. In the opening scene of ‘Bowery Bugs’ Bugs Bunny is a tour guide talking about Brooklyn Bridge and why Steve Brody (a historical character) jumped from it in 1886. A flashback shows Steve Brody, pictured as a typical bully, being out of luck and looking for a rabbit foot as a lucky charm. He encounters Bugs who then drives Brody mad, making him jump from Brooklyn Bridge in the end. 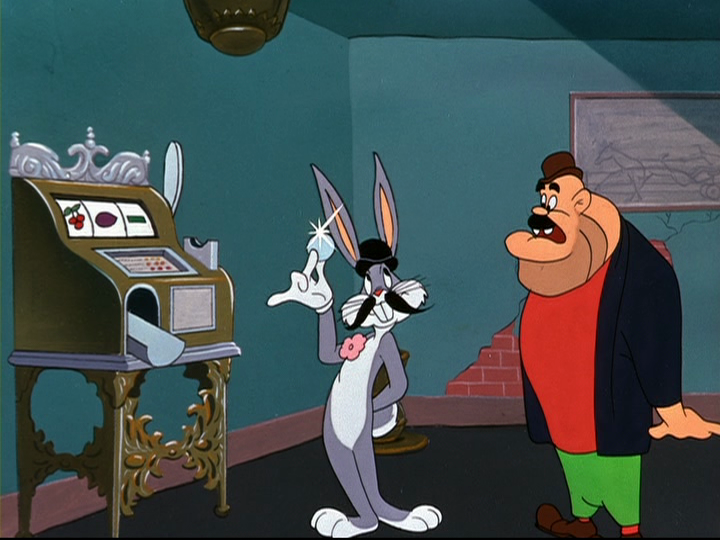 ‘Bowery Bugs’ was the only Bugs Bunny cartoon directed by Art Davis. He does a fair job, although the cartoon suffers from erratic timing. His designs on Bugs Bunny are very reminiscent of those by Robert McKimson. In ‘Porky Chops’ a squirrel from Brooklyn is having a holiday in a forest where Porky is working as a lumberjack. This outlandish idea creates a rather routinely conflict with loads of dialogue. The result is one of Art Davis’s weaker cartoons, particularly because of the squirrel’s rather unpleasant character. This makes it difficult to sympathize with either protagonist. 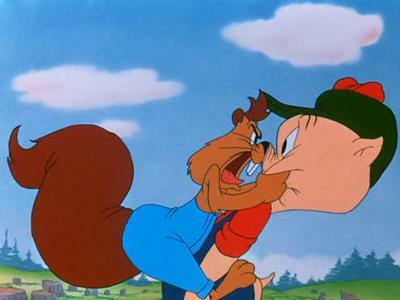 The cartoon shows an interesting mixture of styles: the squirrel looks vaguely like a Robert McKimson-character, while Porky is designed and animated in a toned-down Clampettian style. Porky tries to get rid of an annoying mouse. When it’s announced on the radio that brutal killer Bluebeard is in town, the mouse disguises as the criminal. Porky quickly discovers his disguise however, but then the real killer shows up, too. Porky faints on the spot, and is tight to a rocket and put under a guillotine. It’s the little mouse who saves the day by blowing up the killer, and in the end he’s allowed to stay in Porky’s house. This story is not presented very logically, nor is it very well executed. Therefore, one doesn’t care for the characters, nor is it very funny. Art Davis definitely could do better, but unfortunately this was his last cartoon at Warner Brothers. 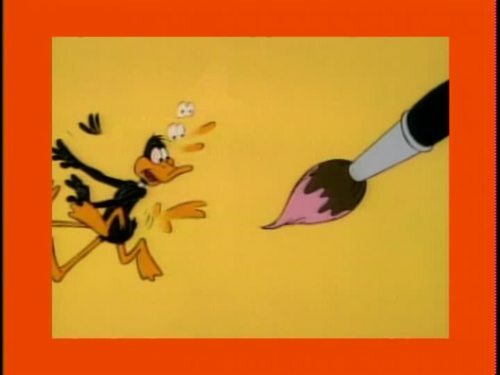 He would not direct again until 1962, when he directed the Daffy Duck short ‘Quackodile Tears’. In the meantime Davis returned to animating, joining Friz Freleng’s unit. Art Davis is one of the unsung heroes of Warner Brothers animation. His unit existed for only three years, but in this short time period he released many fine cartoons, with a distinct and recognizable style. ‘Dough Ray Me-Ow’ is one of his best cartoons, and a rather macabre one, too. This short features a cat, called Heathcliff, who is even too dumb to breathe. Heathcliff, without knowing it, inherits an enormous sum of money. When his ‘pal’ Louie, a cynical parrot, discovers that if Heathcliff dies, this fortune will come to him, he tries to kill Louie in great, funny gags. Surprisingly, in the end he even succeeds, but when he tells the dying Heathcliff his secret, the cat’s nine lives simply refuse to go to heaven! Apart from the main story, the cartoon contains a small running gag in which we see Heatcliff cracking nuts in ridiculously elaborate ways, always involving his own head. ‘Dough Ray Me-Ow’ features watercolor backgrounds, very unusual for Warner Brothers at the time.